Muncie Bridge Club | Need a Partner? 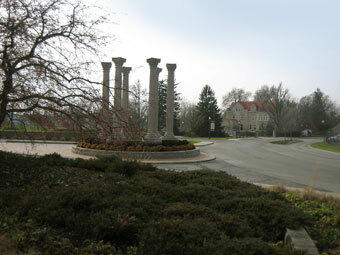 Six Pillars, a monument erected in remembrance of the Ball Brothers. These six pillars were all that was left of the home of Frank Clayton Ball, built in 1895 that burned completely in 1967. All that was left were the six pillars on the front veranda. If you need a partner for any one of our games, please fill out the form below. By submitting this form, you are committing to play on the date given above. If something comes up, and you cannot play on that date, please notify me immediately. Please click here to contact me: Tom Charles.